A recurring theme in my paintings is my response to the Australian landscape, from the lines left by the tide on the sand to the vastness of the horizon. 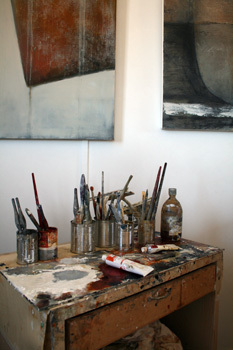 The influence of the view from my studio of the harbour is also evident with abstract references to the passing vessels and container ships. As a migrant I have been overwhelmed by the view of the horizon and the space in Australia (having lived in suburban London, I only ever saw the horizon on our annual seaside holidays!) As a result the horizon has become a strong element in my painting. My paintings are abstracted landscapes and I only paint in oils; using a limited palette of colours that relate to the landscape. Some works are heavily textured, echoing the texture in the landscape; others are built up layers of colour, where the fusion at the meeting point of the blocks of colour is the focal point. There is a deliberate silence to my paintings, by presenting the viewer with space, the work attempts to engage the viewer. It is in our nature to fill that void, bringing our own interpretation to the viewing, remembering a similar journey or view. 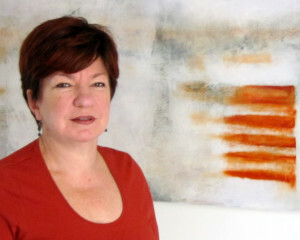 I returned to formal art education as a mature student in 1999 and completed a Diploma in Fine Art at Hornsby TAFE. Following encouragement from one of the teachers there I went on to the University of Sydney, completing my BVA with Honours in 2004. 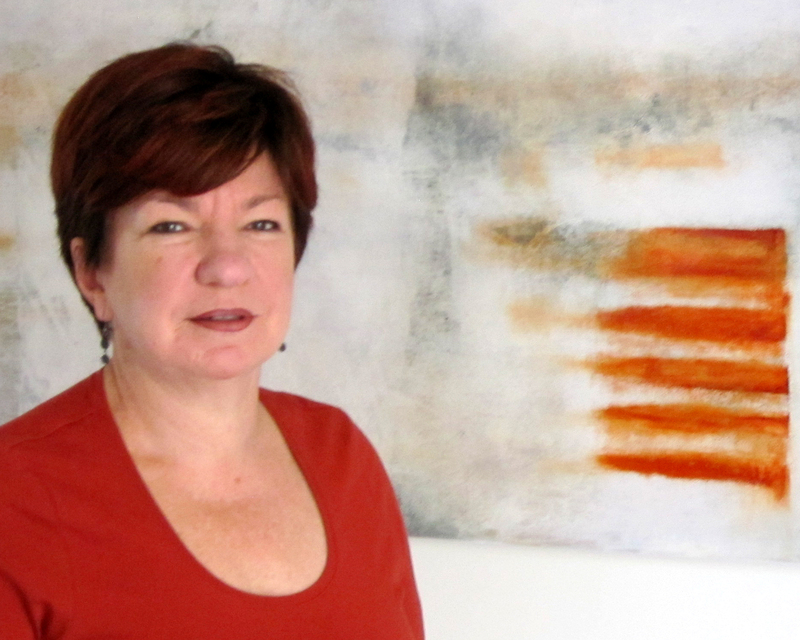 There was a particular area of research that I was interested in pursuing regarding the use of digital images in contemporary art, so I completed my Masters of Visual Art at Sydney College of the Arts. This dissertation addresses the issue of reproduction in my studio practice. Whether I am creating a copy or a new original and whether the digital reproductions of my paintings are art works. Historically, much has been written about how the role of art in society has been considerably altered through mechanical reproduction. Establishing an historical context, this dissertation continues the discussion to include the impact of digital reproduction and the internet on the role of art in a contemporary context. Comparisons between a virtual experience and a real experience and their respective merits are also discussed. The dissertation evaluates other contemporary artists and their use of digital technology. The significance of this body of work is that it confirms the use of digital technology as an additional tool in the art making process and the status of a digital print as an art work.